Kids art is again. I`ll show you how to make a craft with your hands. 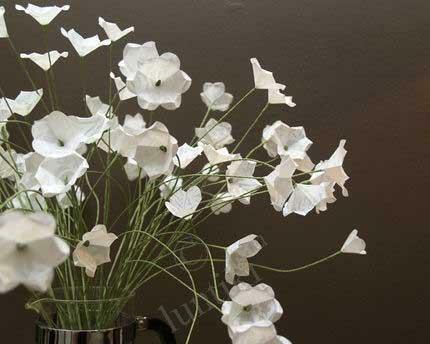 You can try to make these delicate beautiful flowers yourselves. color paper, wire, green thread, glue, scissors. 1. 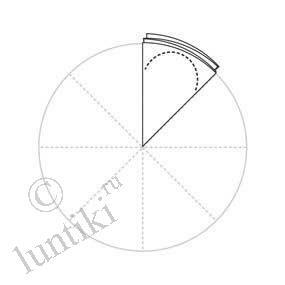 On a piece of paper draw and cut out a circle 7,5 cm in a diameter. 2.Fold the circle 8 times and cut out in such a way that semicircle is above. 3. Unfold the made flower. 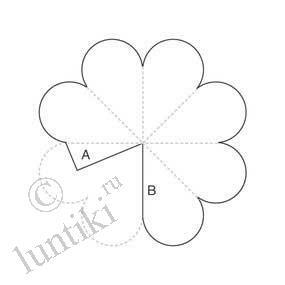 Cut off one petal and leave only the tip of the second one in order to glue as shown in the figure. 4. Glue the tip of the second petal with the next after the cut off one. 5. On the petals by eye or outline slightly the midsts in pencil, start bending them gently. Put aside the made flowers for a while. 6. To make a stem take a piece of wire and bend a hook on the end of it. You may hang a light bead or wind green thread on the hook, put some glue on the thread so that it will not untwist. Let it get dry. 7. Put the stem through the middle of the flower, then wind green thread round it and fasten with glue. You may color the tips of the flowers.